What Spine Arrow Do I Need? The spine of an arrow simply refers to its stiffness. While looking for the perfect arrows you need for shooting with your bow, you have to be aware of the basics of arrow spine. You need to know how the spine is calculated and why you need to spend your time looking for the best arrow to shoot. We will be letting you know about all these things along with the comparison between the arrow spine and arrow weight. You will also be able to find out a user guide chart at the end of this guide to choose the perfect arrows. So, if you are still wondering what spine arrow do I need, then you are in the right place now. 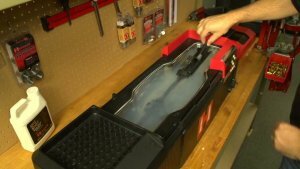 AMS LLC/ AMS Bowfishing - Misc. Arrow spine is the measurement of stiffness of an arrow. While a model of arrow can be available in a single version, you would still be able to find out the same arrow with different spine ratings. The making of a stiffer arrow is all due to its lower spine rating. If you own an arrow with 300 spine rating and your friend owns one with 500, then your arrow would be more rigid than your friend’s. There are two different types of arrow spine available out there. One of them is a Static Spine, and the next one is a Dynamic Spine. A static spine is the spine measurement which is measured in a static state of the arrow. In a detailed way, it is a way how an arrow responds when a weight of 1.94 pounds is suspended from its center. In this case, the arrow needs to be 29 inches long and has to be adjusted by two different ends making a distance of around 28 inches. 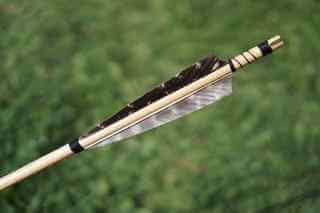 The spine rating of an arrow is defined by the total number of inches it deflects multiplied by 1000 due to the weight. For example, in the case of a static spine, an arrow of spine rating 300 bends 0.3 inches when some weight is applied to it. A dynamic spine defines the way how an arrow responds through the stored energy in the bow after shooting. While determining a dynamic spine, several factors such as peak bow weight, point weight, point combination, bowstring material, strands, vanes, etc. might come in place to find out how an arrow might respond after shooting. Due to this reason, several arrows are designed with a static spine. However, you will easily be able to calculate the arrow’s dynamic spine and hence make it stiffer after shooting with a compound bow. You can do so by reducing the bow and point weight, point combination, using heavier materials for bow strings and adding more strands on the strings as well as using higher vanes and nocking point. The length of the arrow also needs to be short to determine the dynamic spine. While you might be thinking about similarities between arrow spine and arrow weight and planning to replace your arrow with a lighter one to achieve higher speed, you need to know that these things are totally different from each other. You might be thinking about replacing your 330-spine arrow with a 500-spine one to reduce the arrow weight in your bow having a draw length of 29″ and draw weight of 70 pounds. However, everything you are doing is totally wrong. The spine rating of an arrow is related to its stiffness. It depends on how much it flexes, but not the weight. When you are shooting with a bow, every arrow that passes through needs to flex a certain amount. Remember the word “certain”, because if your arrow is flexing a lot, then it might have a weaker spine rating and can be inconsistent while shooting. Using an arrow with stiff spine rating which doesn’t produce a lot of flexes after shooting can provide you consistency while hitting the target. When you are thinking about choosing the best spine of an arrow, you need to know about draw length and draw weight of your bow. The draw length helps in determining the length of the arrow you need to use. On the other hand, the draw weight of your bow helps to determine the force required to shoot the arrow. If you have a longer shaft, your arrow is much likely to flex too much. While choosing the best arrow for your bow, you can take a look at the spine selection guide provided by the manufacturer to find out what shaft you need to select to meet your draw weight and arrow length requirements. The shaft can be determined by the spine rating of your arrow. The speed of your bow might also be useful in case of faster bows since such bows can exert a large amount of force on the arrow. bow’s speed rating, since faster bows, exert more force on an arrow. When you are looking for spine ratings of shafts designed by different manufacturers, you would be finding a lot of differences since the spine rating system isn’t so uniform. In most cases, the grains per inch are printed on the shafts which might put you into a dilemma. Let’s look at an example. Suppose there are two shafts, 330 and 400 which weigh 9.6 and 8.5 grains per inch, respectively. You might be thinking about replacing your 330 shaft with the 400 one since the weight of your arrow can be lighter. The arrow weigh less while doing so, but it is also weaker than the 330 one. This is why, replacing a 330-spine arrow with a 400 one can be a bad choice. If you are really looking for a lightweight arrow, you might want to prefer the recommended arrow spine. However, you also need to switch to a lightweight shaft. When there are two arrows of the same spine rating, their weight in terms of grains per inch can still differ from each other since their shaft could be different. 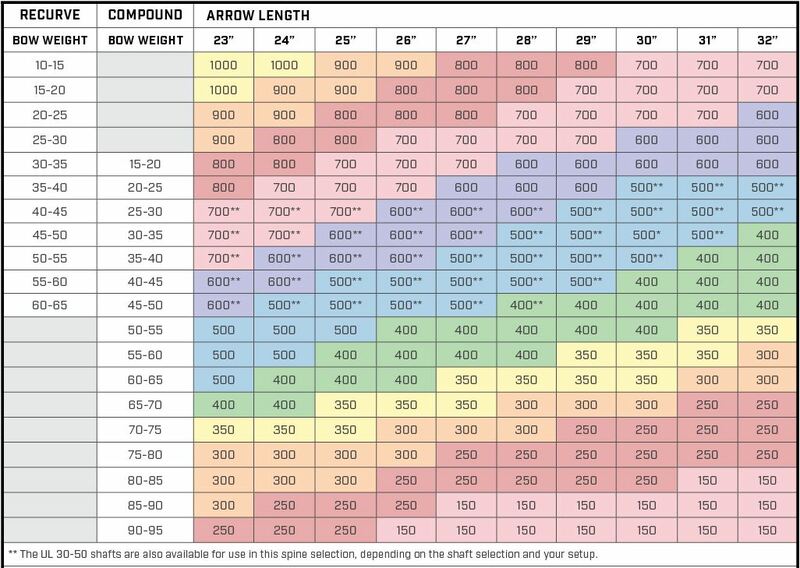 Here’s a comparison table which includes three different arrows which measure 29″ from the insert-end to the end of the nock throat, include grain points of 100 as well as 2″ vanes and 3 Blazers and all these arrows also consist of suitable spine rating recommended for shooting with a bow weighing in at 70 pounds. With the information displayed in the table below, you’d be able to find out that there are still a lot of options available for you to switch the arrow weight instead of changing the arrow spine ratings. With the above information, we believe you are no longer in confusion regarding arrow spine and arrow weight. Now, it is time to find out what spine arrow you need to prefer. There are several factors you need to look for to select the best arrow spine. You can find a lot of information regarding the best spine arrow to choose with the selection charts offered by your arrow manufacturers. While looking at the selection charts, you might be in the final stage to choose one out of the few arrows. In that case, you might want to prefer the one which is stiffer than the others. If you want to change the dynamic spine of your arrow, you can do so by switching the length of your arrow or adjusting the draw weight of the bow you are using. You might also want to consider changing the quantity of weight at the ends of your arrow. Since arrows having broadhead-like tips are highly sensitive to the proper spine in comparison to the arrows containing field tips, it is recommended for you to go for an arrow with the proper spine ratings. Using a stiffer spine mightn’t help your arrow to flex much. With this condition, your arrow won’t be able to bend in a proper level over the riser, which results in an inconsistent arrow flight towards the target. On the other hand, using a weaker spine might make your arrow flex a lot which can also result in an improper arrow flight. This might also lead the arrow to be in contact with the riser. This clearly means you need to look for a weaker spine rating in case your arrow is stiffer. Also, if your arrow is very weak, you need to go for a higher spine rating. Therefore, getting a bare-shaft arrow might be the perfect choice to have a consistent flight towards the target. 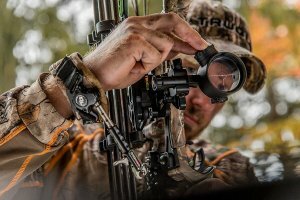 〓MORE DURABLE AND ECONOMICAL, designed to optimize safety for beginners and whoever new to hunting or archery. 〓PARAGON FOR CASUAL SHOOTING with your family and friends. This arrows are tough and need little care. 〓The Arrow Shaft cut to 30 inch to be safe for draw length of most compound, recurve bow and longbows. Recommended for use with 30-45 lbs bows. 〓Standard archery practice tips, inserts and nocks allow you to obtain accessories for repair with ease. Throughout your entire time going through this article, we believe you are now well-known about arrow spine and its differentiation with arrow weight. With the help of our guide on what spine arrow you need to prefer, you might have been able to choose the arrow with perfect spine rating depending on your requirements and the situation. If you have any confusion regarding any of the topics discussed in this guide, you can feel free to write about your issue in the comments. We’d try to get back to you right away.